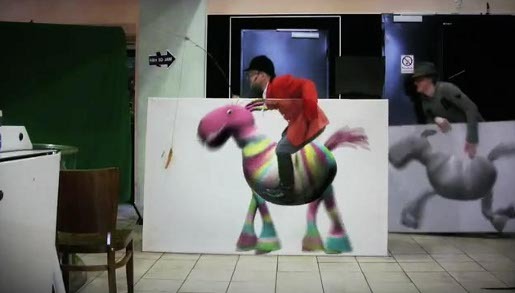 At the 16th Stuttgart Festival of Animated Film, held between 5 and 10 May 2009, five teams were given the challenge of developing an animated film within 48 hours, featuring Trixi, the mascot horse associated with the festival. The winner was “Trixie Dixi”, a 77 second short film by a duo from Kompost Productions, New York City and St Moritz. Trixi the mascot becomes Dixie Trixi, the Triple Crown winning horse running in a German race. Dixie Trixi’s name is inspired by the Dixie Stakes Thoroughbred horse race, started at Pimlico Race Course in Baltimore, Maryland, with the performance of Preakness in 1870. The directors may also have been inspired by speculation over the performance of Mine That Bird at the Kentucky Derby, or Rachel Alexandra at Belmont. Dixie Trixi was animated by Kompost (Oliver Conrad and Gian Klainguit) via Duck Studios, Los Angeles. The banana was provided by the Danish team. The Stuttgart Festival of Animated Film (5-10 May 2009) was founded in 1982 and is one of the biggest and most important festivals of animation film worldwide. 52,500 euros in prize money is awarded over seven competition categories. The Stuttgart Festival of Animated Film works in close relation with fmx/09, Europe’s biggest conference on animation, effects, games and digital media.